Since my fourth cookbook, Dinner Just for Two, comes out April 2nd, it’s time to share book tour info with you! I can’t wait to meet you, hug you, and bring Camille to join all the fun! 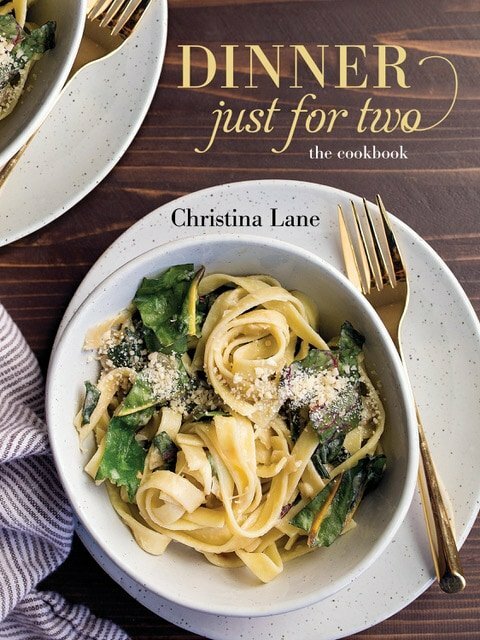 Dinner Just for Two is my favorite book to date (you can find all of my books here), because it’s truly the dinners that we eat as a family week after week. It has well over 100 recipes that are perfectly portioned for two people (maybe a leftover lunch portion, if you fancy), and it has a guide on how to use leftovers. So, if you buy a pound of ground turkey to make my Bourbon-glazed turkey burger recipe, I’ll send you to 5 other recipes to use the other half of the package! The book has one surprise section: bread recipes! It can be hard to scale down recipes for homemade bread, but I’ve done it for you! I also included a small desserts for two section at the back. You probably saw that one coming though, right? So these are the dates so far. I will keep updating this list as time goes on. I’m hoping to hit the east coast later this summer. If you don’t see your city on the list, leave a comment below, and I’ll see what I can do. Also, if it looks like I’m not coming anywhere near you, I’m so sorry! But, the good news is, we have some exciting national media coming up, so you can see me that way, too! AUSTIN, TEXAS on April 15th at Central Library (710 W César Chávez St) from 7-9pm. Book People will be selling books at the event. I’ll be chatting with food writer Adam Boles at this free event. Click here for full details. DALLAS, TEXAS on April 23rd at Half Price Books (5803 NW Hwy) at 7pm. Tickets are FREE, but grab them here. Here’s the Facebook event so you can share with friends. CHICAGO, ILLINOIS on May 18th at Read It and Eat Store (2142 N Halsted Street) at 2pm. Tickets here. Buying tickets early secures a book for 20% off! SEATTLE, WASHINGTON on May 29th at Book Larder (4252 Fremont Ave N) from 6:30-8pm. This is a free event, but you can RSVP and find out more details here. PORTLAND, OREGON on June 1st at Williams-Sonoma. More info coming soon! SPRINGDALE, ARKANSAS on June 29th at Euna Mae’s Kitchen Boutique. More information coming soon! MCKINNEY, TEXAS on July 13th at Ettiene Market (115 W Louisiana Street). Check on the book on Amazon, and peek inside before ordering your copy! I would love to see you in Philly! Warwick, RI, please – love ALL your books, and looking forward to this one! Yay!! Portland, OR made the list! So excited to find out when. Chesapeake, Virginia! Would love to meet you! San Diego!! I have been following you for a long time! Any chance ElPaso, would make the list? The current list of Texas cities and is at minimum 10 hour drive ( one way). Somewhere in central Ohio, please! Riyadh, Saudi Arabia. If possible. Do come by. Would love to meet you. I would LOVE to see you, girl! So excited you are coming to Portland! I love Bob’s Red Mill, but it sounds like you have changed to Williams Sonoma. It doesn’t matter where, I will be there! Please stop in Denver on your way home from Portland!!!! come to Los Angeles please!! I’m working on it! I’ll definitely be in LA doing something fun in a few weeks, but we might not have time for an actual signing :( But I’ll let you know! Remember the Tampa Bay area is only an hour drive to Disney. Come here do a book signing on the beach than take the little one over to see Mickey Mouse. Two birds with one stone. Fante’s cooking store in the Italian market in Philadelphia? They often do this kind of thing on Saturdays. So much more personal and interesting than Williams Sonoma.